“Thus Steve Reich, explaining to Edward Strickland in 1987 why he didn’t write European-style serial music, argued that his repetitive, low-affect music was true to the popular experience of post-war consumer America: “Stockhausen, Berio, and Boulez were portraying in very honest terms what it was like to pick up the pieces after World War 2. But for some Americans in 1948 or 1958 or 1968 – in the real context of tailfins, Chuck Berry and millions of burgers sold – to pretend instead we’re really going to have the dark-brown Angst of Vienna is a lie, a musical lie.” (Fink 2005: 119). In visual art, abstract art uses form colour and line to create a composition which may exist independently of visual references in the real world. From the renaissance up to the mid-19th century, western visual art was underpinned by the logic of perspective and an attempt to reproduce an accurate illusion of reality. The arts outside of western culture showed alternative ways of expressing the visual experience. By the end of the 19th Century, many artists has a desire to create new art which would reflect fundamental changes in technology, science and philosophy. Artists drew inspiration from a variety of sources to fuel diverse theoretical arguments which, reflected social and intellectual preoccupations of the cultures of the time. Above is a 1939–42 oil on canvas painting by Mondrian titled “Composition No. 10”. Responding to it, fellow artist Theo van Doesburg suggested a link between non-representational works of art and ideals of peace and spirituality. The Blues and the Abstract Truth is a jazz album by Oliver Nelson (1961). The album is an exploration of the mood and structure of the blues, though only some of the tracks are structured in the conventional 12-bar blues form. For this week’s composition a short piece was composed in an attempt to honestly reflect the experience of living in the modern world of the internet, terrorism, global warming etc… Something that reflects the abstract truth about my personal self and my relationship with the world. The strategy with this week’s piece was to try and capture the feeling of the progress of the world, always progressing and changing as time constantly moves forward through the time in which we currently live. The main idea or my own ‘abstract truth’ which I attempted to convey was that of the world constantly moving forward developing and improving slowly despite setbacks which sometimes slow the process. Real world issues such as the birth of the internet and how that has contributed to terrorism have been addressed. The threat of terrorism always hangs over and strikes suddenly without warning. Progress is slowed for a time by terrorist actions, but life never stops it always moves forward and recovers, but, sometimes things are a bit different afterwards. Compositionally the piece is arranged based upon a combination of synthesized, sampled and concrete/real world sounds that are manipulated to create an evolving soundscape. It begins with synthesized pads and textures which create a busy atmosphere that is a bit chaotic, like the chaos we live in. The 12/8 drum rhythm helps give the piece a sense of forward motion like time. Early in the piece the drums drop out and we hear a short burst of a dial up modem reflective of the birth of the internet. The drums return and time moves on. Later there is much more dial-up sounds as the internet has expanded which leads into the explosive boom sound which is representative of an act of terrorism. Everything slows down here, by manipulation of the play rate which reflects the turmoil and the temporary halt of progress that a major act of terrorism can cause. Time moves on and the piece speeds up and regains its sense of organisation and pattern as life recovers. Things are not the same however, there is a sweeping EQ effect over the main pad altering its sound from what it was before the boom event. The piece has changed but at the same time is still the same somewhat. Time moves on into the future as the piece fades out with a pitch up. I feel the piece is reflective of the strength of humanity to maintain the constant progress of life despite the setbacks and disasters. Compton, Susan (1978). The World Backwards: Russian Futurist Books 1912-16. The British Library. ISBN 0-7141-0396-9. Fink, R. (2005). Repeating Ourselves: American Minimal Music as Cultural Practice. California UP. Gooding, Mel (2001). Abstract Art (Movements in Modern Art series). Tate Publishing. ISBN 1-85437-302-1. John A. Bargh and Katelyn Y.A. McKenna. (2004). THE INTERNET AND SOCIAL LIFE. New York University, New York. Mondrian, P (1942). Composition No. 10. 1939-42. Piet Mondrian. Oil on canvas. 80 x 73 cm. Private collection. 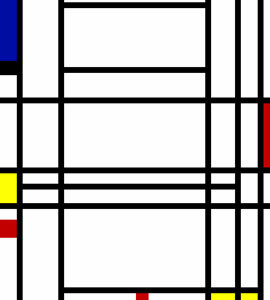 http://www.ibiblio.org/wm/paint/auth/mondrian/comp-10.jpg – accessed 23/05/14. Nastos, Michael G. “The Blues and the Abstract Truth: review” AllMusic. http://www.allmusic.com/album/the-blues-and-the-abstract-truth-mw0000188605 – accessed 23/05/14. Nelson, O. (1961). The Blues and The Abstract Truth. https://www.youtube.com/watch?v=I777BcgQL9o&list=ALBTKoXRg38BBOH0k-4umsmf6KSZ45gqP2 – accessed 23/05/14. Stangos, Nikos (editor) (1981). Concepts of Modern Art. Thames and Hudson. ISBN 0-500-20186-2. Brian Eno is a musician, composer, record producer, singer, and visual artist, regarded as an innovator of ambient music. Through his solo music he has explored musical styles and pioneered ambient and generative music. Key to Eno’s style are innovative production techniques with an emphasis on theory over practice. Much of Eno’s solo work is classed in the minimalist genre and is often referred to as ‘systems music’ or ‘generative music’. Systems music being a term referring to pieces revolving primarily around sound continuums which evolve gradually, often over very long periods of time (Sutherland 1994, 172) and generative music being a term coined by Brian Eno to describe music that is constantly evolving and created by a system. Eno has used generative techniques on much of his works, from early works using tape-delays (1972, in collaboration with Robert Fripp) and Discreet Music (1975) up to the present day. His compositions, lectures and interviews have boosted the popularity of generative music, particularly, among the avant-garde music community. The tape-delay system pioneered by Fripp and Eno, named ‘Frippertronics’, was used for the generative processes on the 1973 album No Pussyfooting. It involved setting up two Revox tape recorders side by side with the tape unspooling from the first deck being carried over to the second deck to be spooled, thus audio recorded on the first deck is then played back on the second deck at a time delay determined by the distance between the two decks and the tape speed (usually a few seconds). The technique was similar to Terry Riley’s Revox tape-delay feedback system (which Riley used to call the “Time-Lag Accumulator”) Riley used on his album Music for the Gift (1963). Fripp and Eno released a second album Evening star in 1975. • Eno, B. (1975). Discreet Music. https://www.youtube.com/watch?v=7-Vq4pmzMaE – accessed 20/05/14. • Eno, B. (1976), “Generating and Organizing Variety in the Arts,” Studio International 984 (Nov./Dec. 1976), 279-83. • Eno, B. (1996) Generative Music. http://www.inmotionmagazine.com/eno1.html – accessed 20/05/14. • Eno, B., Fripp, R. (1975). Evening Star. https://www.youtube.com/watch?v=Edmkr0lDft4 – accessed 20/05/14. • Eno, B., Fripp, R. (1973). No Pussyfooting, The Heavenly Music Corporation. https://www.youtube.com/watch?v=zuf9nwSrtDA&list=PL5DEE869F9BE48A30 – accessed 20/05/14. • Gogins, Michael (1991). “Iterated-Functions Systems Music”. Computer Music Journal 15, no. 1 (Spring): 40–48. • Riley, T. Music for the Gift V. https://www.youtube.com/watch?v=-TKFLiuHYos – accessed 20/05/14. • Sheppard, D. (2008) On Some Faraway Beach: The Life and Times of Brian Eno. Orion. • Sutherland, Roger. (1994). New Perspectives in Music. London: Sun Tavern Fields. ISBN 0-9517012-6-6. • Tamm, E. (1995) Brian Eno: His Music and the Vertical Color of Sound. Da Capo. • Terrano, A (2007). Dub Mixing. Sound On Sound. http://www.soundonsound.com/sos/jul07/articles/dubmixing.htm – accessed 20/05/14. • Toop, D. (2004). The Generation Game: Experimental Music and Digital Culture. Audio Culture: Reading in Modern Music. Cox, Warner (Eds.). New York. Continuum. Philip Glass is regarded as one of the major minimalist composers along with Steve Reich, Terry Riley and La Monte Young. Although Glass himself has sought to distance himself somewhat from the minimalist label as he describes his own work as “music with repetitive structures”. Much of Philip Glass’s early work on minimalism occurred between 1967-1974. It was I 1967, just after arriving in New York that Glass was influenced by a performance by Steve Reich which included the ground breaking ‘Piano Phase’. Between the summer of 1967 and early 1969, Glass composed a number of works, including Strung Out (for amplified solo violin, composed in summer of 1967), Gradus (for solo saxophone, 1968), Music in the Shape of a Square (for two flutes, May 1968), How Now (for solo piano, 1968) 1+1 (for amplified tabletop, November 1968) and Two Pages (1969). Much of these pieces clearly demonstrated Glass’s new-found minimalist approach of which a key component was the additive process. Philip Glass later went on to compose music for operas, symphonies and film soundtracks whilst further developing his distinctive style. The first opera of his portrait opera trilogy: Einstein on the Beach (1968) has four acts (framed and connected by five “knee plays” or intermezzos), and was composed by Philip Glass and directed by theatrical producer Robert Wilson. One of the most famous soundtracks composed by glass is that of Koyaanisqatsi (1983). Although the quantity of music was as long as the film itself, the soundtrack was only 46 minutes when initially released, consisting only of selections from the film. In 1998 glass rerecorded the album with two additional tracks and extended versions of previous tracks. Feeding off the popularity of the music the Philip Glass Ensemble has toured the world, playing music of Konyaanisqatsi live in front of the movie screen. The additive rhythm process is the main technique which gives Glass’s work his distinctive sound. For many of his pieces, the opening simply establishes a melodic unit which is repeated anything from to 2 to 8 times or more. The next unit is then simply an addition or subtraction of notes to the previous one, a process which is repeated throughout the piece. “….…a sequence begins with a simple diatonic 8-note rising and falling five finger exercise; the next figure repeats the next two notes (making a 10-note figure), then the original, then the (original) 5th and 6th are added again (12-note). To this a repeat of the first three are added (15-note), then notes 5 to 7 (18-note), then all the first four are added in repeat (22-note) and finally the last four are added again. So that by the end of the sequence the original 8-note sequence has grown-without the addition of any new pitches-into a 26-note melody, and the original sequence of notes 12345678 has been permutated by adding one unit at a time into the following: 121123123412345656756785678 where, because the second note is the same as the 8th, the third the same as the 7th and the fourth the same as the 6th, five separate pitches both retain their original ordering and are subjected to a process regular temporal shifts in a constant pattern of movement.” (Nyman, M. 1999). This week’s composition takes some influence from Music in Twelve Parts in that different instrumental parts have been layered. With different instruments playing slightly different melodic lines and the additive process being used. The sounds used for this week’s composition were some sampled horns played through Kontakt and synthesized sounds made in Zebra2. 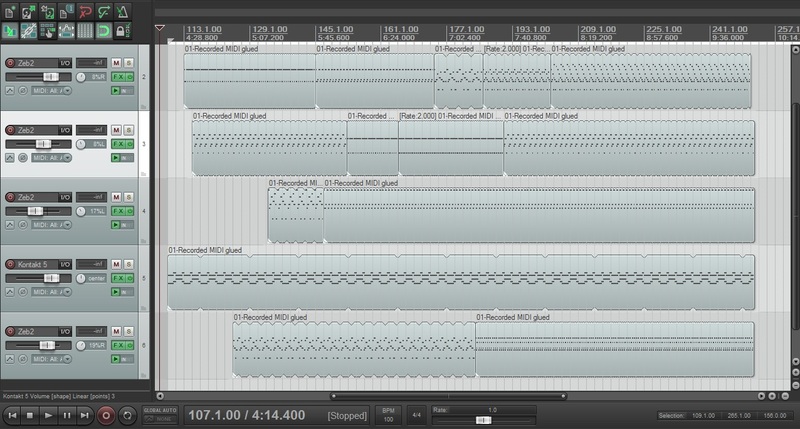 The below picture demonstrates the arrangement of the composition in Reaper. With each separate midi item being just a bit long or shorter (by an addition or subtraction) of notes than the midi item before it. The rhythm of the horns part is actually fixed throughout the entire piece. There are four others parts layered which are actually subjected to the additive process. I feel however that by layering so many parts all playing slightly different melodies and subjected to different additions and subtractions that the effect of experiencing different time signatures is lost somewhat and everything sounds a bit 4/4. I would say to have many parts is fine but many a number of instruments playing the same melodic lines (so overall less different melodic lines happening at once) is better for experiencing the rhythmic changes. • Glass, P (1968). 1+1, Live Performance. https://www.youtube.com/watch?v=ZYAyPre0vD8 – accessed 13/05/14. • Glass, P. (1968). Einstein on the Beach. https://www.youtube.com/watch?v=poTLWcgTtow&index=11&list=PLTUlTwlsdlFQhHsAoG7sCxumrigHW-qJk – accessed 13/05/14. • Glass, P. (1994). Two Pages/Contrary Motion/In Fifths/In Similar Motion (1994 issue). https://www.youtube.com/watch?v=8ZMJcrVIHCU – accessed 13/05/14. • Glass, P. (1996). Music in 12 Parts (1996 issue). https://www.youtube.com/watch?v=j7fcHnR7UF0 – accessed 13/05/14. • Glass, P. (1998). Koyaanisqatsi. https://www.youtube.com/watch?v=r4WlNj1TTqA – accessed 13/05/14. • Nyman, M. (1999). Experimental Music Cage and Beyond. Cambridge, Cambridge University Press. • O’Mahony, John (2001), “The Guardian Profile: Philip Glass”, The Guardian (London). http://www.theguardian.com/education/2001/nov/24/arts.highereducation1 – accessed 13/05/14. • Potter, Keith (2000). Four Musical Minimalists: La Monte Young, Terry Riley, Steve Reich, Philip Glass. Music in the Twentieth Century series. Cambridge, UK; New York, New York: Cambridge University Press. • The Independent (2007). Philip Glass on making music with no frills. The Independent London. http://archive.today/4CStk – accessed 13/05/14. Reiteration of musical phrases, figures, motifs and cells. Additional stylistic features include additive process and phase shifting. “The idea of minimalism is much larger than many people realize. It includes, by definition, any music that works with limited or minimal materials: pieces that use only a few notes, pieces that use only a few words of text, or pieces written for very limited instruments, such as antique cymbals, bicycle wheels, or whiskey glasses. It includes pieces that sustain one basic electronic rumble for a long time. It includes pieces made exclusively from recordings of rivers and streams. It includes pieces that move in endless circles. It includes pieces that set up an unmoving wall of saxophone sound. It includes pieces that take a very long time to move gradually from one kind of music to another kind. It includes pieces that permit all possible pitches, as long as they fall between C and D. It includes pieces that slow the tempo down to two or three notes per minute”. (Tom Johnson, 1989). Reich’s started life as a composer with investigations into twelve tone composition where, he experienced a greater interest in the rhythmic aspects than the melodic aspects. Reich’s early minimalist compositions were innovative involving the use of tape loops to create phasing patterns. This can be heard on ‘It’s Gonna Rain’ (1965) and ‘Come Out’ (1966). In 1967 Reich attempted to translate the tape loops phasing technique into a live performance technique; the result was Piano Phase and later that same year Violin Phase. In Piano Phase, two live pianists repeat twelve-note loop, initially in perfect sync. However, as one player maintains even tempo the other speeds up slightly until the two parts are one sixteenth note apart, they lock in for a bit then phase shift some more and so on. The method employed here which Reich favour in his earlier phase shifting compositions is that of the gradual phase shifting, later he preferred to phase shift in steps of say 16th notes or 8th notes. Steve Reich composed perhaps his most seminal piece during 1974-1976, it was entitled ‘Music for 18 Musicians’ and by now Reich was preferring the sound of the phase shifting in steps technique, which many people including myself feel is more rhythmically pleasing. For this week’s composition, the phase shifting technique of Reich was investigated. Taking influence from Reich’s ‘Music for 18 Musicians’ this week’s piece is composed in 12/8 with a fast tempo. The method of phase shifting in steps of 8th notes is investigated and the characteristic 8th note string lines further accentuate the ‘Reich’ sound. The approach to composing was to first construct a 12/8 loop of notes which when phase shifted would produce aesthetically pleasing harmonic relationships. Also, the minimalist technique of adding one note at a time was explored to give a sense of gradual change and dynamic range of some elements are experimented with. Aidu, Peter (2007). Peter Aidu plays Steve Reich’s “Piano Phase” with an absolutely unique technique. https://www.youtube.com/watch?v=qKXy1FPTdvg – accessed 06/05/2014. Anderson, Virginia. 2013. “Systems and Other Minimalism in Britain”. In The Ashgate Research Companion to Minimalist and Postminimalist Music, edited by Keith Potter, Kyle Gann, and Pwyll ap Siôn, 80–106. Farnham, Surrey: Ashgate. ISBN 978-1-4094-3549-5. Johnson, Tom. 1989. The Voice of New Music: New York City 1972-1982 – A Collection of Articles Originally Published by the Village Voice. Eindhoven, Netherlands: Het Apollohuis. ISBN 90-71638-09-X. Reich, Steve; Hillier, Paul (Editor) (April 1, 2002). Writings on Music, 1965–2000. USA: Oxford University Press. p. 272. ISBN 0-19-511171-0. Reich, Steve (1965). It’s Gonna Rain. https://www.youtube.com/watch?v=vugqRAX7xQE#t=560 – accessed 06/05/2014. Reich, Steve (2008). Music for 18 Musicians, Tokyo Opera City, Japan, 2008. https://www.youtube.com/watch?v=zLckHHc25ww – accessed 06/05/2014.